Find hotel near South Australian Maritime .. Located in the Bond Stores a large historic warehouse building, the museum has three stories of exhibits showcasing Australia’s maritime history. There is a life-sized replica of a sailing vessel that visitors can climb aboard and explore. There are also several interactive displays, which are informative and fun. The South Neptune Lighthouse, which is a short walk from the warehouse, is also part of the museum and visitors can scale the tower for some stunning views of the city and harbour. Also accessible are the museums historic floating vessels, the Steam Tug Yelta and the police launch the Archie Badenoch. There is also an interesting gift shop in the museum. The exhibition building is equipped with a lift and toilet for disabled people. Child - $5.00 AUD, Concession- $8 AUD, Family- $25 AUD. Last Entry at 4.45 pm. How popular is South Australian Maritime Museum? People normally club together Adelaide Oval and Semaphore Jetty while planning their visit to South Australian Maritime Museum. This place surprised us with how good it is. 3 floors and several areas exploring the different connections of people to the sea in SA. Some highlights... A small merchant sailing ship you can actually walk onto/into. Reconstruction of the living/sleeping quarters of migrant ships of the 1800's. This is an amazing museum. It's bigger than what you think, you could spend hours here looking around. Very cheap entry which gives you discount entry to other museums in the Port. Great place to visit with so much history to be found. I have been here a few times and find something different to amaze me each time. The kids absolutely loved it. Nicely done museum with great information about the maritime history of South Australia. Lots of physical displays and interactive elements to keep people engaged. 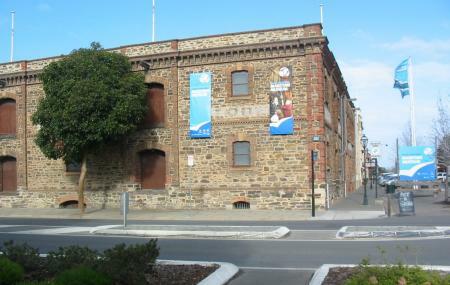 Located in a nice old building in the historical precinct of Port Adelaide. Great place to bring the kids. Lots to do and learn and the school holiday activities they run are lots of fun even for the parents too. The staff are really lovely and the gift shop has lots of great things to buy.